Nara is a great place to see Japan’s famous autumn colors. The city is filled with park, temples, shrines and gardens where you can enjoy the leaves. Here is a list of the best spots and information on timing. In a hurry? Scroll down for our list of the best foliage spots in Nara. 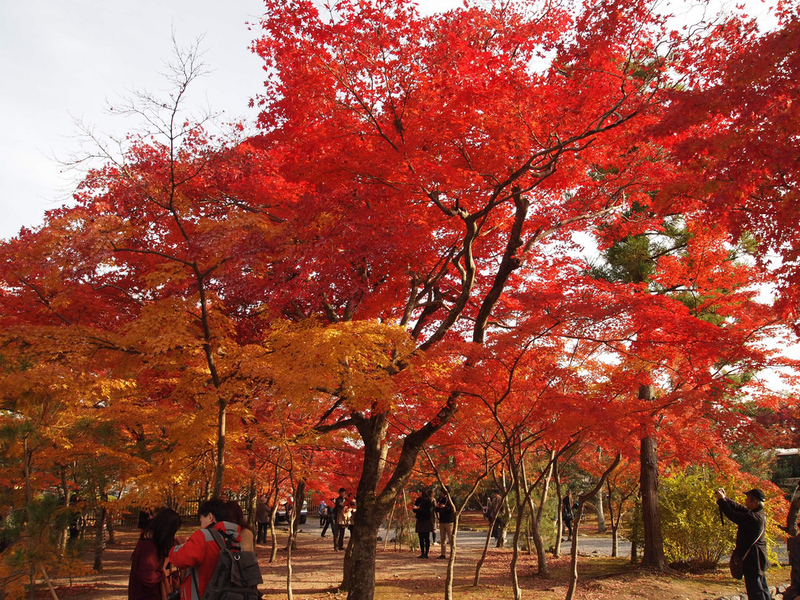 Otherwise, read the following section on the best time to see the autumn colors in Nara. When is fall foliage season in Nara? In an average year, the leaves start changing color sometime in October in Nara. The peak of autumn color usually comes in mid-November, and you can usually see colors on the trees until mid-December. Thus, in an average year, the foliage season in Nara lasts from 15 October to 15 December, with a peak around 15 November. Here is our list of the best fall foliage spots in Nara. For more details on these places, visit our Things To Do in Nara page. Nara-koen Park: The vast expanse of Nara-koen Park is the perfect place to enjoy the autumn colors, and the deer make nice additions to your photographs. Todai-ji Temple: There aren’t many trees within the Daibutsu-den (Great Buddha enclosure), but the area around the temple, including the walk up to Sangatsu-do and Nigatsu-do, is covered with trees that burst into brilliant colors in the fall. Kasuga-taisha Shrine: The trails in and around Kasuga-taisha Shrine are lined with trees, including several broadleaf varieties that turn color in the fall. The walk from Nigatsu-do to Kasuga-taisa is a great way to enjoy the colors. Isui-en and Yoshiki-en Gardens: These two adjoining gardens are perhaps our favorite places in the city to enjoy the autumn colors. The garden setting here makes for particularly lovely photos. Muro-ji Temple and Hase-dera Temple: These temples, in the southeast of the prefecture, can easily be paired together to form a great half-day trip out of Nara City. Both look lovely during foliage season. Tanzan-jinja Shrine: This shrine in the south of Nara Prefecture is one of Japan’s most famous maple leaf viewing spots. The red of the shrine against a backdrop of fiery maples is an unforgettable sight.